Nose: Fruit cake, rum & raisin chocolates, almonds, and mixed peel. A little bit of new make coming and going. Palate: Sweet spices, mixed fruit peel, dark chocolate, and something sweet at the back such as golden syrup. Mouthfeel: Thick and creamy. A little bit of that new make from the nose is still hanging around. A little bit rougher than I was expecting. Finish: Coffee, mixed nuts, sweet and treacly. Long and warm on the tongue. For me, Glenmorangie’s Signet is a bit all over the place – the nose is great at first, but gets a little rough. The mouthfeel is similar; thick and creamy to start with, but feels a little too thin and alcoholic after a while (note – at no point does the alcohol feeling get any burn). On the other hand the palate is rich and dark and so inviting, and the finish is long, and almost dusty with coffee beans and mixed nuts coming to the fore. Glenmorangie hasn’t really released a whole lot of information in regards to Signet, stating on their website that it is “A fusion of unique and rare elements, and clouded in secrecy”, and “matured in a selection of the world’s finest casks”. 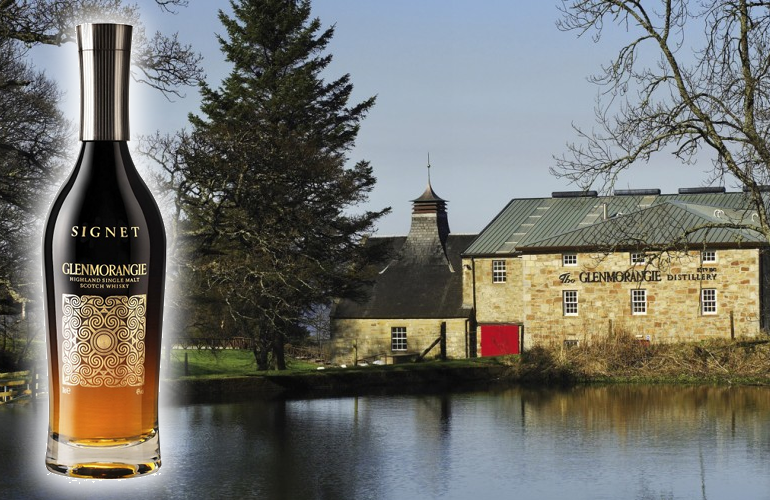 They mention that the whisky was distilled over 30 years ago, it was malted in-house at the Glenmorangie distillery, and that most of the casks are American white oak which are holding their “unique roasted ‘chocolate’ barley malt” (which is normally used in the production of dark beers such as stouts and porters). They do also state that it is non-chill filtered. The Glenmorangie distillery is notable for a few things; for one, it has the tallest stills in Scotland, with copper necks over 5m tall crating a quite light spirit. They also have a policy of only using their casks a maximum of twice, which should provide richer flavours to their whiskies. The men from Tain were some of the first to experiment in finishing whiskies in different casks, and it is a process that they use frequently in nearly all of their whiskies – most commonly finishing their whisky in Port pipes, sherry butts, and Sauternes casks. Although those three are their most common finishing casks, “Dr Bill” (Lumsden) is said to have an amazing array of casks at his disposal, and he is not afraid to use them.